So, first and foremost the young man who explored Jersey thought of himself first and foremost as 'belonging entirely' to the Sacred Heart. This sense never left him - and indeed becomes stronger and deeper over the course of his life. 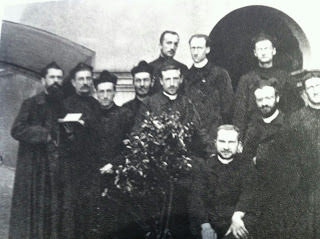 But in Jersey he had to work out his relationship between his devotion and total dedication to the Sacred Heart and his growing interest in geology: he had to resolve the tension between his spiritual and scientific life. At first he was minded to give up on his passion for geology, but this was not to be. As he explains, gradually he achieved a synthesis : and the Heart of Jesus was to become the means by which this synthesis was to take place. It was therefore in Jersey that he began his great spiritual and intellectual journey with a 'firm grasp of both ends of the line'. During his time in Jersey - residing in Maison St. Louis ( now the Hotel de France ) and Bon Secours ( now Highlands College) - he spent, according to Barjon ' all his leisure and holidays in scientific excursions around the island ( cited in Mortier and Aboux, (eds) Teilhard de Chardin, Album, Collins, 1966, p 30). So, Teilhard must have known the island extremely well indeed. Michelle Le Morvan has provided a good outline of his work in her ' The geology of the Isle of Jersey' published in the Teilhard Newsletter (Here). He returned to Jersey in 1919, just after the Great War. 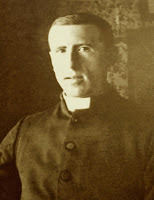 By this time he had spent three years in Egypt, been ordained a priest, (1911) and had served with great distinction in the medical corps during the war. And by the time of his visit in 1919 he had already began to develop his ideas on paper. In Jersey in the summer of 1919 he wrote a beautiful and fascinating piece on the 'spiritual power of matter' which expresses how he must have felt and thought about his journey thus far. In The Heart of Matter ( written in Paris in 1950) which gives us the most important insight into his devotion to the Heart of Jesus he attaches this piece along with another piece - ' The picture' which had written three years earlier in 1916 at Nant-le-Grand. Evidently Teilhard thought that these two pieces express his 'state of mind' as it had evolved during the war. During his time in Jersey the Sacred Heart was unquestionably a central idea and symbol : it was the central and seminal devotion of his life. ( see Heart of Matter, p42) But for him it assumed an altogether more cosmic and evolutionary significance than just the rather limited form associated with the devotion as practised by his beloved mother. He saw it as a symbol of a divine power of love : a 'fire with a power to penetrate all things'. It was a symbol of God at the heart of all things. 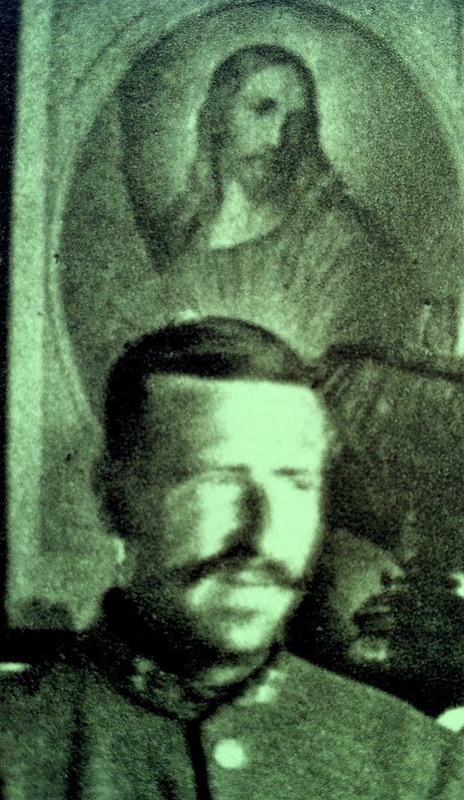 During the war (in 1916) he had written three stories in the style of Benson (The picture, the monstrance and the pix) all of which explore in an imaginative and mystical way his understanding of the Sacred Heart. When he was demobilised he returned to Jersey for a retreat at St. Louis in August 1919. Re-reading 'The spiritual power of matter' it strikes me now one can feel the influence of the island. It is inspired by the story (in Kings) of Elijah being caught up in a whirlwind and taken up to heaven by a fiery chariot (the Cherubim and the Ophanim!) He describes the whirlwind (as the'Thing') as moving towards the man and his companion as the 'moving heart of an immeasurable pervasive subtlety' which 'penetrates into the narrow confines of his heart' and calls upon him to do battle with ' the fire that consumes and the water that overthrows'. Perhaps on his return to Jersey he was reflecting on his battle to reconcile his priesthood and his passion for matter? This conflict as a young man had at first resulted in a decision to give up geology, but he was fortunately encouraged to carry on by Pere Troussard, the novice-master. His life ever since had been an ongoing battle to reconcile the spiritual and the scientific. He had spent the last few years literally in a battleground - and 'the Thing' smelt of battle. 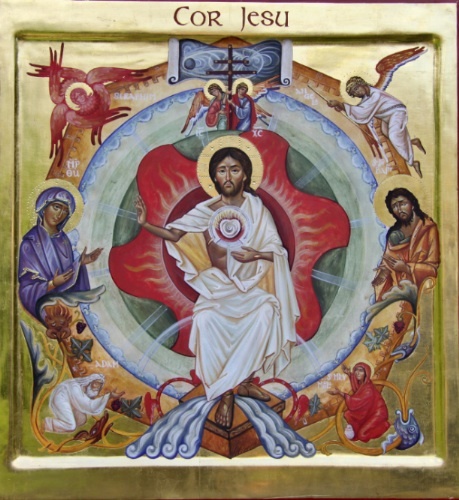 But now in Jersey he did not feel despair or hopelessness, but the very opposite: he felt a zest of life and an excitement in how his struggles with the Sacred Heart - the heart of God at the heart of all creation - were unfolding. He feels the joy of fighting and feeling his own strength - like a swimmer in the water. He desires to plunge into the 'heart of the whirling cloud'. He surrenders to the 'heart of the world' that was spreading its warmth not like a furnace, but like the warmth from a human body. In the 'spiritual power of matter' he is - like Elijah - borne away by the fiery chariot, drawn into the heart of the world and heart of the world of the spirit. Like Elijah he leaves a son below on the desert sands. ‘Blessed be you, harsh matter, barren soil, stubborn rock: you who yield only to violence, you who force us to work if we would eat. ‘Blessed be you, perilous matter, violent sea, untameable passion: you who unless we fetter you will devour us. ‘Blessed be you, mighty matter, irresistible march of evolution, reality ever newborn; you who, by constantly shattering our mental categories, force us to go ever further and further in our pursuit of the truth. ‘Blessed be you, universal matter, immeasurable time, boundless ether, triple abyss of stars and atoms and generations: you who by overflowing and dissolving our narrow standards or measurement reveal to us the dimensions of God. ‘Blessed be you, impenetrable matter: you who, interposed between our minds and the world of essences, cause us to languish with the desire to pierce through the seamless veil of phenomena. ‘Blessed be you, mortal matter: you who one day will undergo the process of dissolution within us and will thereby take us forcibly into the very heart of that which exists. Teilhard left Jersey, but I am sure it never, ever left him. Next time I am in Jersey I think I will read out his Hymn to Matter over the dramatic coast at La Corbière - hopefully when sea is passionate and violent and crashing against the harsh and stubborn rocks.